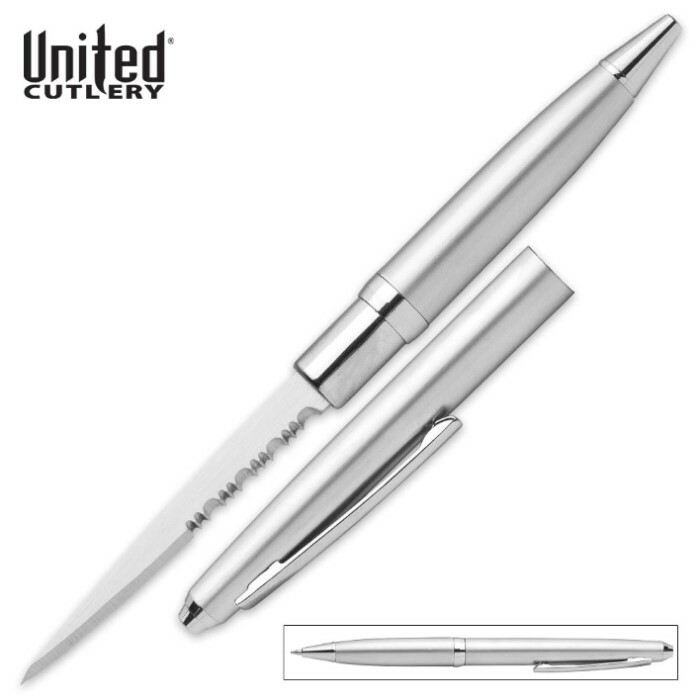 Silver Serrated Ink Pen Knife | BUDK.com - Knives & Swords At The Lowest Prices! This is a great pen. Its a everyday use. The blade came sharp. Fast shipping. Works very effective, had to use it last week, that mugger didn't even see the two inch stainless steel serrated blade coming, turns out he was just a friendly civilian who just wanted to let me know i dropped my wallet ugh fml u kno. had a hard time explaining it to the cops but since it was a pen knife they looked right over it and i told them someone else did it and fled. This is a great item and it was everything I expected. Does anyone know where tgo get refills for the pen?? Nice gift, my wife loved that I was thinking of her and her safety. Knife is incredibly sharp. 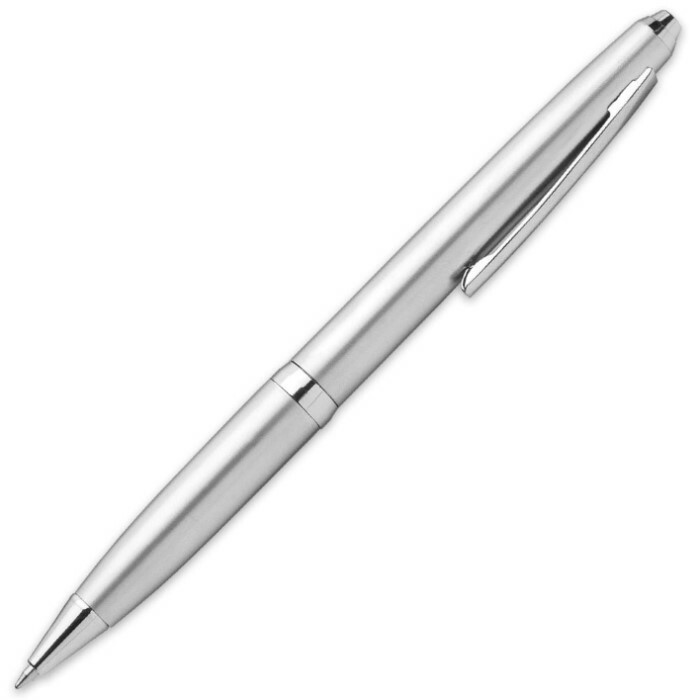 The pen is okay, not the best writing instrument, but does write well. I see this being kept in a special compartment or in a pocket for special use when needed. I thought the knife was amazing. Its actually very sharp and the pen looks perfectly normal. It writes well and there are no logos on it. i love it. I would certainly recommend it. The blade is alot smaller than shown in the picture, and it is not serrated all the way up the blade as shown. 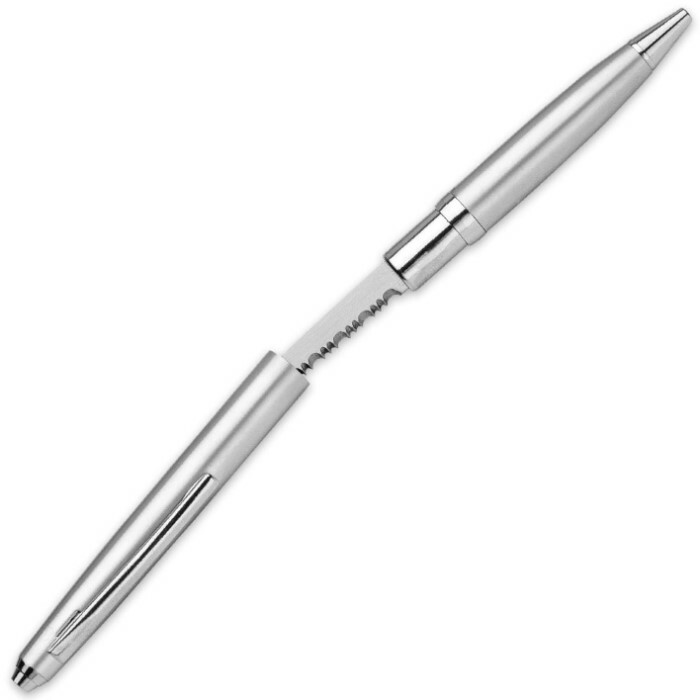 Other than that, it is sturdy and the pen part writes nice.